What’s So Special About Lead Indicators? 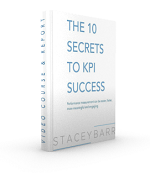 Most performance measures or KPIs tell you what happened. But if we're really going to manager company or organisational performance, we need to know something about what's going to happen. And that's what lead indicators do. They are a special breed of performance measure or KPI because they have predictive power.